IDC Staff Instructor Tim teaches the PADI Open Water Diver course! Home/News, Open Water Course/IDC Staff Instructor Tim teaches the PADI Open Water Diver course! Tim is one of our full time PADI IDC Staff Instructors and a member of our Go PRO team, and he is conducting the PADI Open Water Diver course for two of our international clients at our premier PADI 5 Star IDC beach house on Gaya Island! Tim possesses a thorough understanding of the PADI system of diver education and he is highly experienced in teaching entry-level divers. During the PADI Open Water Diver course, Tim will brief each skill and deliver its demonstration before his student diver attempts it for the first time. 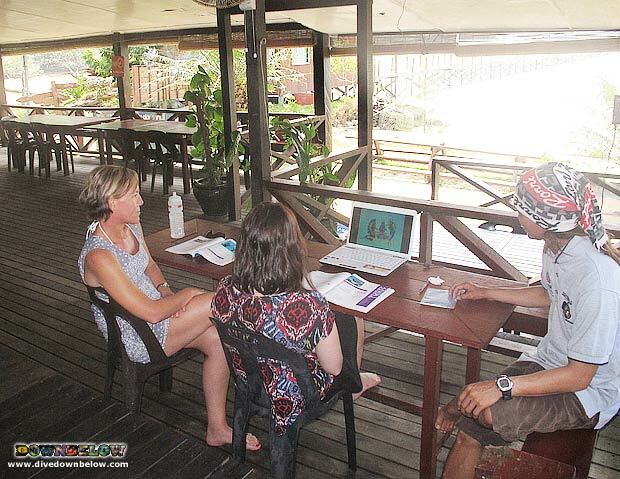 The PADI system provides Tim with the tools to conduct his course, which are necessary to their development. Learning materials include, the PADI Open Water Diver manual, Recreational Dive Planner and manual, PADI Open Water Diver video, quizzes and exams. Tim will use his extensive experience to provide his high standard in quality dive instruction to successfully certify his student divers. Contact one of our friendly and helpful staff in our Head Office at KK Times Square to discuss a program suitable for your needs to begin your passion in scuba diving! By Joanne Swann|2014-03-20T09:15:04+08:00March 20th, 2014|News, Open Water Course|Comments Off on IDC Staff Instructor Tim teaches the PADI Open Water Diver course!